This is a partner post brought to you in cooperation with Cutter, all opinions are my own. Summer is just around the corner. In fact, this is the last week of school for the boys and we head off on our family camping adventure this coming Saturday. With summer, unfortunately come the bugs. In Florida, they all arrive by the tour bus load and step out with their tiny sunglasses, beach towels around their neck, ready for a season full of drinking us all dry. Not this summer though, because as you recall, we learned how to battle the bugs last summer with the help of Cutter Insect Repellents, and we intend to do it again this year! Did you know that more than 65% of people say that mosquitoes are the number one thing that ruins their day, but only 2 out of 5 of us bother to put on repellent before we leave the house? How crazy is that? You wouldn't leave the house to spend the day outside without sunscreen, so take a few seconds to spray some repellent on before heading out. 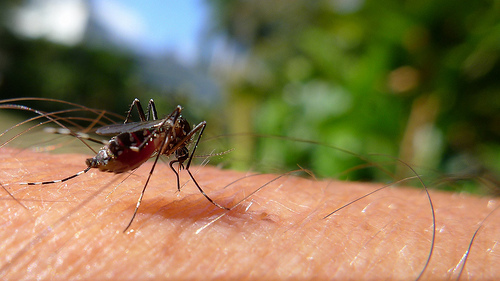 Mosquitoes are not just pests, they carry harmful diseases like West Nile, Dengue Fever and Lyme Disease. If you are fair skinned, overweight, pregnant or male, you are even more attractive to mosquitoes and they can detect an unprotected spot on the skin as small as a dime! So in the words of a major shoe brand "Just Do It" and put on some insect repellent! Cutter Insect Repellents come in a variety of different types, scents and strengths, to meet the needs of anyone. Personal insect repellent sprays are a great first line of defense against mosquitoes and ticks. When we are headed out to the park, beach, or just hanging out in the backyard for a BBQ, our favorite repellent spray is the Cutter Dry Insect Repellent. It goes on without a greasy oily mess, has virtually no scent and protects for hours with 10% DEET. Some of our favorite summertime activities are playing outdoors, whether it is going on the slip 'n slide, having a BBQ or camping out, Cutter helps protect us no matter what we choose to do outside. For camping, we will be taking the Backwoods Cutter Insect Repellent with us. It lasts a whopping 10 hours and protects again mosquitoes, ticks, chiggers, fleas, gnats and other pests! If all natural products are your thing, then Cutter Natural Insect Repellent is your product, with essential oil derived from geraniums. Our second favorite type of Cutter product for chasing away the flying pests are the citronella candles. They are made to protect your deck, patio, picnic table or other confined location while outdoors. Cutter makes them in a variety of shapes, sizes and burn times. My personal favorite are the Cutter Scented Citronella candles. We tried the vanilla and lavender candle one the back porch as we watched the boys play outside in the water, and it made all the difference in the world. Want to protect your yard too? Cutter makes foggers, as well as yard sprays to help eliminate mosquitoes from your yard, deck and patio. These products are completely safe for pets and children once they are dry too! Don't let mosquitoes and other pests wreck your fun this summer. Head on over to the Cutter site and find the perfect products to help you battle the bugs with their targeted three zone system. You can also get information and tips from the Cutter Facebook page and Pinterest Page. How do you enjoy a bug free summer day? Geh - that photo of the mosquito is giving me the hibby-jibbies! I'm glad you'll be fully stocked for your camping trip. The Cutter Naturals sound like a great addition to the line. Great photos! We are being KILLED by bugs this year, it's a nightmare! Definitely a must here in FL. We aren't often outside. We use this most during 4th of July when we are out waiting for fireworks. We have an insane amount of mosquitoes here in AL. A good bug spray is a must have when camping, have a fabulous time on your camping trip! I need to pick up some of this stuff before school gets out. My daughter tends to get eaten alive by bugs during the summer months. This is good info to have, I didn't know you could 'bomb' your yard. I hate mosquitoes! We need some of this before summer. I loathe mosquitoes. They are nasty disease carrying blood-suckers. :( We will be bombing our yard this weekend. We have tons of them here too. We will be stocking up! I hate bugs so I will definitely be checking this out! the bugs are SO bad this year. We have so much standing water here in Florida it makes it worse I feel like. Glad I use Cutter for my whole family!